It feels good to be able to write this! The largest closed church in Naples, the church of the Girolamini (also spelled Gerolamini in some sources)—closed for over 30 years—has been reopened. The large white house of worship is part of the entire Girolamini complex and sits on the north side of via dei Tribunali just around the corner from the intersection of that street and via Duomo. The façade bears magnificent sculpture by Giuseppe Sanmartino; the interior contained works by Francesco Solimena, Luca Giordano, Belisario Corenzio, and many noted artists of the Neapolitan Baroque. 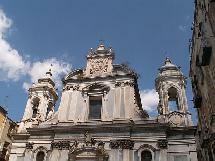 Construction of the church was begun in 1592. As recently as the 1968, the interior was still spectacular enough to stand in for the cathedral of Naples in a film entitled Operazione San Gennaro [Eng. title: The Treasure of San Gennaro]. I stopped by the other day and to my admittedly non-expert eye, they did a magnificent job with one exception—the organ. When I looked in 2009 (when the church was partially reopened to give visitors a peek at how the restoration was going, the instrument was a wreck. I expected—or at least hoped for—a cosmetic reconstruction since a complete musical restoration appears to be prohibitively expensive. Instead, they have now simply removed the organ and polished up the organ loft/niche in the north transept just to the left of the main altar; the frame that held the pipes has also been redone, but the pipes, themselves, are gone. That space is now empty; I don't know if there are plans for further restoration (photo, below). Also, some of the side chapels still await whatever works of art are to be installed in them. Some of the works already back in place are four paintings by Luca Giordano: St. Gennaro in the Furnace; St. Charles Borromeo and St. Philip Neri; St. Charles Borromeo Kissing the Hand of St. Philip Neri; and St. Nicholas of Bari and the Saving of the Three Innocents. Those works by one of the best-known artists of the Neapolitan Baroque were in storage for safe-keeping and their return to public display is an important step in preserving the cultural history of the city. Also to be returned are three works by the Bolognese painter, Guido Reni (1575- 1642): Jesus Meeting John the Baptist; The Ecstasy of St. Francis; and The Flight into Egypt. I had expected the church to open as a museum or some other cultural institution (the way the church of Donna Regina did a few years ago), but it now seems to me from the interior of the church— with pews and altars set appropriately—that the Girolamini is not destined for that but will serve as a house of worship. photos: (top) facade; (left, below) restored interior; (right, below) organ loft.